Beijing takes to the air: "Sir, will that be champagne... or missiles?" Beijing takes its commercial aircraft industry very seriously. So much so, that it has become a national priority. But this is not about serving Dom Pérignon in First Class, nor about providing the best in commercial airline safety and comfort. This is about how the Chinese manipulate the commercial airline industry to better serve their military power in the air, with strategic positioning which gives the Chinese Communist government stronger and faster access to the Asian neighborhood, and beyond. As a strategic industry, the Chinese commercial airline industry directly feeds the technology that the People's Liberation Army (PLA) needs. The PLA is the joint military organization of all land, sea, strategic missiles and air forces of the People's Republic of China. Chinese armaments include sea-launched missiles, both nuclear and conventionally armed, nuclear and diesel submarines, cruise missiles, intercontinental ballistic weapons, combat aircraft and bombers, and anti-satellite weapons. During any 24 hour period the PLA often thinks about Americans. Rest assured these are not loving thoughts. Back in Beijing, bureaucrats are becoming masters at marketing, because appearances matter — particularly to diplomats and business interests on both sides. So, the Chinese government has even named one of their commercial airlines "Joy Air" — like any industry that needs a positive image. And, who's helping "Joy Air" remain joyful? In 2003 China was falling behind on its goals to achieve military power in the air. To remedy this situation the Chinese Communist dictatorship began to focus on China's commercial airline industry, as a mechanism to upgrade its defense capabilities. Beijing began to amalgamate civil and military activity, through military-to-civilian and civilian-to-military technological sharing. 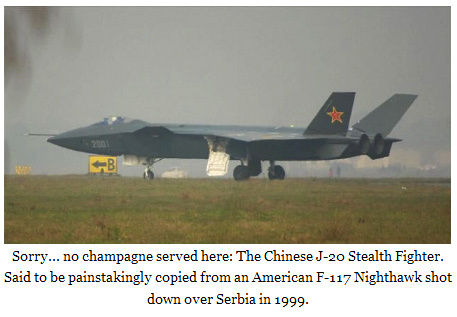 The Chinese Communists set up enterprises disguised as civilian projects — such as the ARJ-21 and the C919 commercial airline projects, in order to gain access to technology that could be fed into their military and defense departments. This deceitful activity has been disguised for a long time under programs labeled as "cooperation" and civilian R&D (Research and Development). Communist China's participation in such R&D and technological exchange programs has fueled the growth of their military aerospace capabilities — turning China into a growing threat to the United States, and other nations. Beijing may not want to reveal everything it has up its sleeve, but it is sure happy to show off some of its military capabilities. Enough to scare others. In a congressional report, Shirley Kan, Specialist in National Security Policy Foreign Affairs, Defense, and Trade Division described how on January 11, 2007, at 5:28 pm EST, China conducted its first successful direct ascent anti-satellite (ASAT) weapons test, launching a ballistic missile armed with a kinetic kill vehicle (not an exploding conventional or nuclear warhead) to destroy its own Fengyun-1C weather satellite at about 530 miles up in low earth orbit (LEO) in space. The weapon was fired from a mobile transporter-erector launcher (TEL). 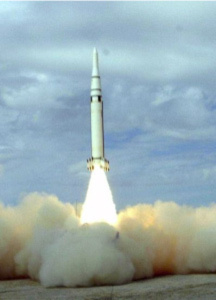 China reported that it used a two-stage, solid-fuel medium-range ballistic missile that was launched from a TEL. A U.S. intelligence official testified to Congress that the U.S. designation of this ASAT weapon is SC-19. A National Security Council spokesman issued the White House's public response on January 18, 2007 stating that "China's development and testing of such weapons is inconsistent with the spirit of cooperation that both countries aspire to in the civil space area." In February, 2008, a year after the Chinese ballistic missile show-of-force, the United States proved it could do the same thing by firing a heat-seeking missile against one of our own satellites. There's no lack of warnings about China's growing military capabilities, and the way in which it is obtaining intelligence and military technology. "In 2008, China established the Commercial Aircraft Corporation of China Ltd. (COMAC) to focus on the commercial aircraft market. Other Chinese companies are involved in the commercial aircraft market, too. The extent to which the creation of COMAC, and other efforts to separate commercial from military work are effective, remains to be seen. 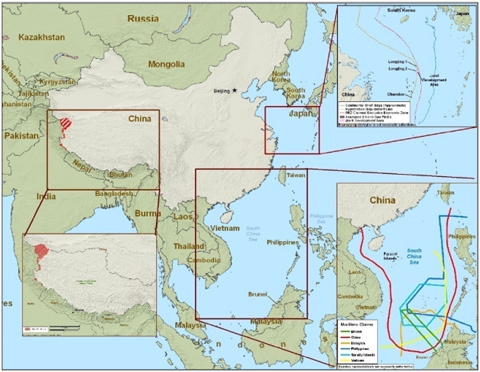 It is clear, however, that China intends to develop new capabilities through its commercial programs, some of which could then be used to support its military programs." "China's aviation industry wants to turn from Cinderella into the belle of the global aviation ball. With strong political backing, ample funds, and privileged access to fast-growing domestic civilian and military markets, the country's aviation industrial barons are pursuing an ambitious strategy to build an internationally competitive, innovative and comprehensive aviation design and manufacturing base within the next 1-2 decades." What is disconcerting is that China's progress in military capabilities is taking place in plain sight, with plenty of U.S. government public warnings — which President Obama and American corporations doing business with China choose to ignore. When Obama announced his campaign for the presidency, claiming that he would bring "change" — what most people did not understand was that "change" meant yielding to China's influence and economic power. On April 1, 2009 President Barack Hussein Obama and China's Communist Dictator, Hu Jin Tao, met in London during the G-20 meetings, to discuss Sino-US relations and the world economic crisis — a crisis which seems to affect everyone, except Communist China, which is getting stronger day by day — both financially and militarily. The meeting in London was an important one for the United States, because it defined how President Obama would deal with China. Hu Jin Tao praised the China-US relations under President Obama, as being off to a good start. In other words, America was behaving. Hu Jin Tao announced that he had been keeping close relations with Obama, and that the foreign ministers of both countries had already exchanged visits. Hu Jin Tao invited President Obama to visit China. Obama accepted the invitation. It looks like the 'Economic Track' must have served as Obama's marching orders, since by the time Obama arrived in China in November 2009 he looked more like a client visiting his lender, than the President of the United States. So much so, that China was most interested in financing the Obama Health Care Plan, by carrying the U.S. Treasury notes. The London meeting served as a platform for the Communist Chinese dictator to extend invitations, left and right — or request RSVPs. Admiral Gary Roughead, US Chief of Naval Operations was invited to visit China to attend the big events planned for the 60th anniversary of the founding of the Navy of the Chinese People's Liberation Army. One can only imagine how impressed Admiral Roughead must have been when his counterpart, Vice Admiral Wu Shengli, displayed all his red power. (Washington, DC: U.S. Department of Commerce, September 3, 2010). 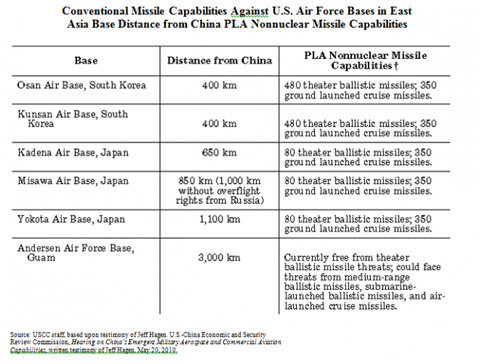 The biggest threat that China presents with its advanced air and missile capabilities is the increased ability of the People's Liberation Army to inhibit U.S. military operations in the Asian theater. This is referred to as China's "anti-access and area denial strategy." It can also deter third countries from intervening in a conflict between China and Taiwan, and areas where there are territorial disputes, including Japan. 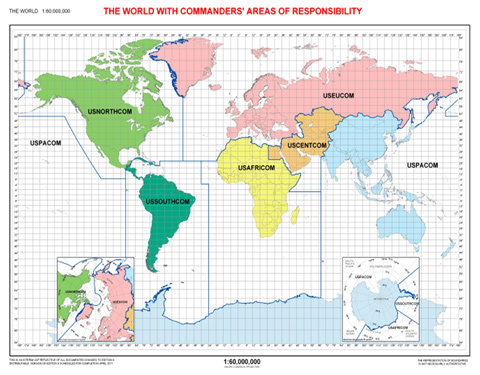 The Department of Defense released today the updated Unified Command Plan (UCP), a key strategic document that establishes the missions, responsibilities, and geographic areas of responsibility for commanders of combatant commands. Unified Command Plan 2011, signed by the President on April 6, assigns several new missions to the combatant commanders. Every two years, the chairman of the Joint Chiefs of Staff is required to review the missions, responsibilities, and geographical boundaries of each combatant command and recommend to the President, through the Secretary of Defense, any changes that may be necessary. As in past years, the 2011 review process included the combatant commanders, service chiefs and DOD leadership. - Shifting areas of responsibilities boundaries in the Arctic region to leverage long-standing relationships and improve unity of effort. As a result of this realignment, responsibility for the Arctic region is now shared between USEUCOM and USNORTHCOM rather than USEUCOM, USNORTHCOM and USPACOM as directed in previous UCPs. - Giving USNORTHCOM responsibility to advocate for Arctic capabilities. - Codifying the President's approval to disestablish U.S. Joint Forces Command. — Expanding U.S. Strategic Command's responsibility for combating weapons of mass destruction and developing Global Missile Defense Concept of Operations. — Giving U.S. Transportation Command responsibility for synchronizing planning of global distribution operations. UCP 2011 continues to support U.S. defense security commitments around the world while improving military responsiveness to emerging crises. China continues to accelerate its offensive air and missile developments without corresponding public clarification about how these forces will be utilized. Of particular concern is the expanding inventory of ballistic and cruise missiles (which include anti-ship capability) and the development of modern, fourth- and fifth-generation stealthy combat aircraft. In conjunction, China is pursuing counter-space and -cyber capabilities that can be used to not only disrupt U.S. military operations, but also to threaten the space- and cyber-based information infrastructure that enables international communications and commerce. Absent clarification from China, its military modernization efforts hold significant implications for regional stability. China's rapid military expansion coupled with its unclear intent poses a concern to the U.S. and many regional nations. Meanwhile, U.S. corporations continue to feed China technology. Eaton Aerospace, Rockwell Collins, Sagem, Aircraft Braking Systems, B/E Aerospace, Goodrich, Goodrich Aerospace (Hella), Hamilton Sundstrand, Honeywell, Kaiser Electroprecision, Kidde Aerospace and Defense, MPC Products, and Parker Hannifan. General Electric, Eaton Aerospace, Rockwell Collins, Honeywell, Goodrich, and Parker Hannifin. As described above, Hu Jin Tao extended an invitation to President Obama to visit China in the fall of 2009. During his visit to Beijing in November 2009, President Obama went so far as to pledge that he would expedite Federal Aviation Administration certification of the ARJ-21, in order to help the Chinese government avoid obstacles to future international sales. A scary move, considering that the ARJ-21 had been flagged for not meeting safety standards. We don't expect that the Chinese government is going to care if a plane full of Chinese people crashes. We expected, however, for Obama to care. So, exactly what did President Obama accomplish during his visit to Beijing in November, 2009? Obama cautiously mentioned human rights; however, no political prisoners were released before, during or after Obama's visit to China. Obama also mentioned China's undervaluation of its currency (an ongoing economic ploy by China's government). China has responded with nothing but excuses. 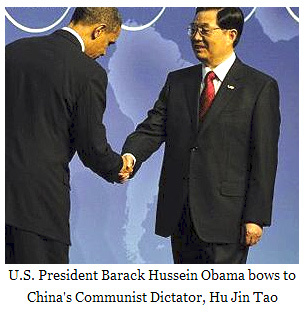 Obama's 2009 visit to China left an image of America being brought to its knees, in front of the Communist giant. This is not surprising, considering that by the time that Obama arrived in Beijing, China owned $789.9 billion in Treasury notes. So, the 2009 April Fool's Day meeting in London proved to be a fruitful event for Hu Jin Tao. Hu covered a lot of ground. It looks like he had Obama in one room, while he was meeting in another room with Russian President Dmitry Medvedev, going over Sino-Russian relations. A few weeks earlier (February, 2009) China had extended a $25 billion loan to Russia, in order to finish the construction of a pipeline between the two countries. In exchange, Russia entered into an agreement that is very advantageous for China's access to natural resources. The agreement is said to last 20 years. Hu must have been happy to flaunt his influence around London in 2009. After all, China has also become the big winner in the Central Asia economic battle with Russia. China is now the main source of foreign investment and aid to Central Asia. This is not favorable to cultural and ethnic separatists, who are losing support from a neighborhood much too eager to please China, and eager to follow Beijing's diplomatic lead. Russia's Gazprom lost a bid against China's National Petroleum Corp., to buy a 50% stake in Kazakhstan's biggest oil company. China's State Development Bank has also invested $4 billion in Turkmenistan's largest gas producer. There's no question that China will have tremendous access to natural resources and to the economy of Central Asia, while gas flows through a colossal 4,350-mile Natural Gas Pipeline, designed and built to ship gas from Turkmenistan through Uzbekistan and Kazakhstan — and straight into China. 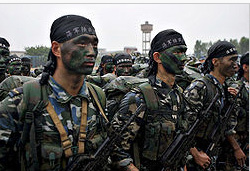 Communist China's dangerous economic and military march across the globe continues. Stay tuned for Part Two of The Beijing Affair. "...absolutely serious journalism, with a touch of humor." Marielena Montesino de Stuart's commentaries cover politics, foreign affairs, religion and culture, at www.TheRomanCatholicWorld.com and www.CourageforAmerica.com. Her insightful opinions are read by thousands around the world. Marielena is a former candidate for the United States Senate (on the ballot, Republican 2012). Her memorable campaign is regarded as a turning point in the restoration of authentic conservatism in America. Please click here to read her full bio. You may contact Marielena Montesino de Stuart through the following link. JESUIT CREATIVITY IN THE VATICAN: Is Francis sending mixed messages about marriage?